Varieties that have (W.L.) by them are on a wait list. 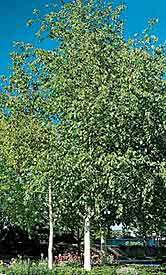 See pictures below for some examples of shade trees. creamy white to parchment white. Vigorous grower. Tolerates wet, poorly drained soils. Exfoliating bark. when older. Clumps of (3) or more stems. color is a golden yellow. A tough tree for the landscape. Fast growing, graceful & symmetrical branching. fall foliage. Well loved shade tree. brilliant golden yellow fall color. Nice shade tree. turn to pink, glossy foliage with red fruit. Twisty trunk. rich foliage and fragrant pale yellow flowers. foliage is glossy green with bright yellow fall color. Also know as Tamarack. Drooping branches. Green needles turn yellow and then fall off in fall. Likes moist, well drained, acidic soils. fades to green as it matures. Thornless & seedless. Outstanding branching habit, hardiness and vigor. before maturing to glossy green leaves. and frost cracks. More colors than other Sugar Maples. This selection is male, does not produce seeds! turning bright orange to scarlet in Fall. the fall season with later fall color than other maples. Its red color is more consistent and deeper color! This tree makes a stunning accent plant in the landscape. Maple. Straight trunk and well shaped head. Height: 50’ Foliage: Dk. Gr. Introduced from the U of M in 1980, very hardy tree. foliage and orange, russet red in fall. and lawn use. Thick foliage and dense. Excellent branching habit and vigorous grower. autumn Blaze. Red/burgundy fall color. red fruits, August-September. Needs good drainage. 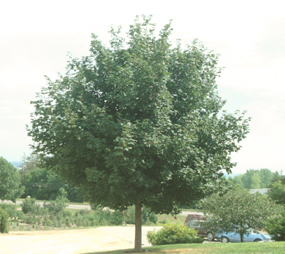 transplant, this tree is great for street or yard use. transplant. Great for street use or landscape tree. The leaves hang on the tree in winter. well suited to moderate and arid conditions. Height: 30-40’ Foliage: Bright Gr. drooping branches. Graceful. Likes moist areas.